Does anyone else remember recipe cards? This was before the internet, way back in the beginning of time. People used to get stuff in the mail. There were lots of opportunities for subscriptions that would send you books or music or plates or whatever every month. I got a few cookbook series that way, which I still have (of course) as well as recipe cards. For those of you who don’t know about the cards they were very devious about it all. First off one received the box to put the cards in…. a big box. The cards would come every month but one didn’t get chicken one month and cookies the next. A packet of 25 cards would have 2 chicken recipes, 1 bread, 3 soup. etc. In order to get all of any one category one had to get all of every category – in other words, once you started you needed to continue receiving and paying every month until the end. At which point they would send adverts for the next big thing…. Because the recipes are on cards, rather than in a book, it’s easy to go through them and toss the ones you don’t like. I did that a few years ago, getting 2 boxed sets down to 1 box. I ran across this and really liked the photo (which looks nothing like my photo). But I didn’t like the recipe. The idea came just as it was time to pull the remnants of the basil. Add shallots and sauté until brown and crisp, 15 – 20 minutes. In another skillet (or after shallots are done) heat white wine. When simmering, add turkey cutlets and gently poach, 5 – 10 minutes, depending on thicknes. Remove turkey and keep warm. Increase heat under wine and reduce by half. Pour wine into a blender, add basil and puree. Pour back into the skillet and stir in yogurt, off heat. Spoon basil sauce onto a platter. Add turkey cutlets. 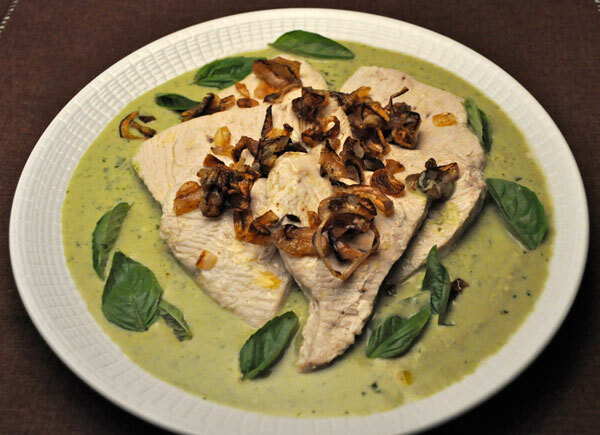 Top cutlets with crisp shallots, garnish with basil leaves and serve. I still get a lot of things through la poste. Living in the country is not always conducive to good shopping. Amazon is a life saver.I have ordered everything from my slow-cooker to shoe laces. I go to the shops, if I can’t find it I come home and order it. I just saw a statistic that ordering meals is very popular among ‘millennials’ with 69% of urban males and 58% of urban females getting dinner delivered in the last three months. A bit more surprising was that 45% of Americans of all ages had ordered restaurant delivery in the last three months. It is beyond my comprehension to have that available. When I don’t feel like cooking we have omelets. How about leftovers…. that works. Maybe Amazon will start delivering 3 star meals by drone to isolated French farmhouses. Was talking with my hairdresser. Her husband just finished working for the U.S. Postal service. Right after he retired the postal service contracted with Amazon to deliver, first thing in the morning, something called Amazon Fresh, which turns out to be fresh and packaged groceries, including meat and veggies. He is glad he retired before they started because the postman or woman has to do those deliveries before they can sort and deliver their usual mail, resulting in many late days and missed dinners for them. Maybe your time is coming for fresh deliveries? On those relatively rare nights when cooking dinner is a chore for me, I have three options; Chinese chow delivery, pizza delivery, and My Beloved, who can cook simple things while trashing the kitchen. The Chinese chow is good and delivered promptly. The pizza is just okay and the wait is long. As per our deal, if he cooks, I must do the dishes. Not surprising that most evenings, I’d just as soon cook. We have a new service that just started in my area, though they’re in others nearby, that has a list of 10 – 12 restaurants that I can order from, through this service and said service will deliver. It’s WONDERFUL! We’re in a more rural area and sometimes, I just don’t want the longer drive to get to civilization where I can sit at a restaurant and eat, but I’m exhausted from my extended drive home and don’t want to cook. It’s also way too easy to spend a lot of money that way which is why we don’t use them often, but it’s wonderful to have available. I was too cheap to ever subscribe but often kept the recipe cards they sent as promotions. I use them as bookmarks in my cookbooks. What a novel idea to actually make something on the recipe card! I confess I’m not at all a fan of turkey in any form, but I love the sound of the basil sauce. nightsmusic, when we lived in the US Domino’s started up deliveryto our area with the 30 minute guarantee. It was not physically possible to do it so they quit – even thought we all said we’d be very happy with 45 minutes. We got 1 pizza.